Place the chopped onion into a small cup and cover it with the red wine vinegar. Soak the raisins in warm water, for about 8-10 minutes and drain. In a pan on a medium heat toast for a few minutes the hazelnuts until they start to release their oils, make sure you don’t burn them. Once they have cooled down a bit and are easy to manage cut them in half or small pieces if you prefer. Peel and chop the apple into small cubes, cover the pieces with the lemon juice *and leave on the side. That step will prevent them from discolouring and will result in a more sour taste. Instead you can always chop the apples just moments before mixing them with the other components of the salad. With the help of a mandoline thinly shred the cabbage and place it in a large bowl. Add the remaining dry ingredients into the bowl and toss. In a cup or a small bowl whisk very well the olive oil, mustard and honey (or sugar). Stir in the vinegar with the chopped onions. Finish the dressing adjusting the seasoning with salt and pepper to your liking. Pour the dressing over the salad, toss very well making sure that all the components of the salad are well covered. 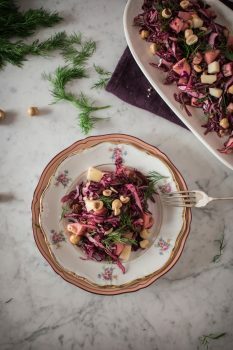 Garnish with sprigs of dill and sprinkle some more hazelnuts on top.